Pervious concrete pavement is a green building practice that has gained a lot of momentum in recent decades. 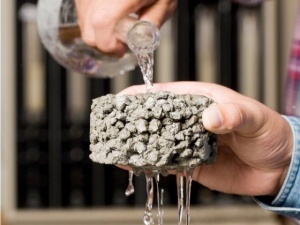 This EPA approved permeable building material is a special concrete made with larger rock. Eric’s Concrete Pavers mixes this onsite with a special bonding agent. This process creates large gaps inside the concrete that allow for precipitation and other liquids to pass through. These larger gaps created in pervious concrete pavement makes it safer for travel. There is never any standing water to freeze, and snow melts faster. Pervious Concrete helps the environment by reducing water runoff and allowing for essential groundwater recharge. This also reduces erosion. Pollutants are filtered by the pervious concrete so only clean water is making its way back to the earth. If you would like to learn more about Pervious Concrete applications CLICK HERE. What Are Pervious Concrete Pavers? Pervious concrete pavers, also known as permeable pavers, are a preformed concrete paver that has larger gaps within that allow water to pass through quickly. Permeable Concrete Pavers are installed with layers of varying-sized stone or aggregate underneath, that filter and direct storm water to underground aquifers. Due to the pervious concrete pavers’ water drainage system it is safer for travel. There is no standing water and snow melts faster. They also last longer because they are designed to redistribute weight. Pervious pavers, or permeable pavers, are environmentally friendly by protecting water supplies. They help reduce the amount of storm water runoff contaminants and pollutants that go along with water runoff. This system is also very effective for combating erosion as well. If you would like to learn more about pervious concrete pavers CLICK HERE. The Tahoe Regional Planning Agency has established a new code for homeowners in the Tahoe area. 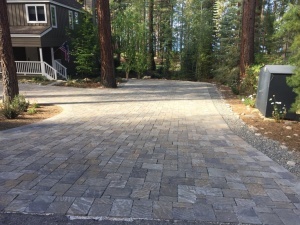 Due to the exceptional environmental friendly nature of pervious concrete pavement and pavers Tahoe homeowners are now allowed to build and remodel up to 20% more of their property than they ordinarily would be able to if they used conventional concrete pavement or pavers. These larger surfaces can be used to expand decks, patios, walkways, and even driveways.